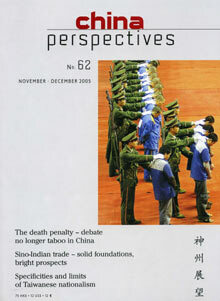 Despite the sensitivity of the subject, the death penalty is currently a topic of public discussion among Chinese legal experts who are now openly wondering about its possible abolition. This debate is of interest on three counts. First, it goes hand-in-hand with a retrospective reading of the Chinese penal tradition, highlighting the succession of attempts at modernising criminal law for over a century. It also shows the ever present weight of the Maoist legacy and the contradictions of the present policy, caught between a concern for legality and continuing recourse to exceptional measures. Lastly, legal professionals and theorists alike are engaging in a reviewbased on specific casesof the particular features of contemporary Chinese society and culture. This article examines the migration of rural workers towards the cities in the light of national data on the two periods 1985-1990 and 1990-1995. It briefly considers the restrictions on workers’ mobility, focusing particularly on the main instrument of control, the hukou. The article highlights the finding that despite such continuing obstacles to mobility, the migratory dynamic is consistent with the deepening integration of the Chinese domestic market. Booming bilateral trade has come to be the strongest pillar of China-India rapprochement. This has not only since overtaken the pace of political confidence-building but also has a substantial impact on their mutual perceptions. Their border trade has especially brought about a noticeable transformation in their remote and problematic border regions. This has contributed to overall tranquillity and peace in the area and has as well facilitated progress in their border negotiations. This boom in trade has also introduced new trends. The two states are no longer only recipients on foreign direct investment but have entered into a new phase of being investors, both mutually as in other regions. In this new context, the increasing deficit in the energy sector and the competition to capture new markets present major challenges to sustaining this boom in their bilateral trade. This article examines the current social problems in Macauinequalities, problems in urban housing, traffic and transportation, air pollution, crime and deviant behaviour, and education. It does not focus on one social problem in detail; rather, it attempts to offer a broad picture of the issues from a sociological perspective. To help solve these problems, it seems that Macau has to build a stronger civil society and continue to democratise its political system. How Macau deals with these problems will determine the identity that people in Macau want to build for themselves.